Desk hutches are available in espresso, mahogany, cherry, or walnut finishes, all of which offer a professional appearance. You can also choose between two or four sliding doors to maximize storage space. Additionally, we offer hutches with sliding or swing doors to accommodate space restrictions. In addition to hutches, we offer replacement hutch doors and tack boards that are perfect for pinning reminders and calendars. Also make sure to check out other great items from Alera, Basyx, Bush Business Furniture, HON, Mayline and Safco. Safco 3671MH Low-Profile Mahogany 10-Section Desktop Hutch - 57 1/2" x 12" x 12"
Desk hutches are designed to sit on top of credenzas and offer valuable storage space for binders and important documents. All of these products are also made of durable materials, so you can rest assured they’re built to last. Best of all, these items are offered at affordable low prices that allow you to purchase the office furniture you need without breaking the bank. 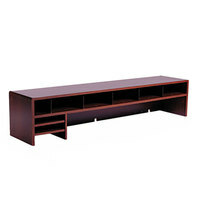 For related products, check out our office storage and safes, office seating, and office decor. If you're wondering where to buy safco desk hutches, we have a large selection of safco desk hutches for sale at the lowest prices.